Take a break at Lily Lake! 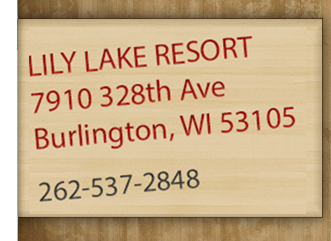 Minutes from the busy shores of Lake Michigan and Lake Geneva, Lily Lake Resort is a place where families, friends, and travelers stay for an enjoyable outdoor vacation. Our hotel and grounds are a popular choice to host a party, a family get-together, or a sports meet with friends. Guests have their pick from indoor hosted events to outdoor-inspired entertainment retreats. Our friendly staff is always ready to make your planned or impromptu event flow effortlessly. Take a break and relax at Lily Lake! Our guests find adventure in a variety of recreation and entertainment opportunities – hiking, hunting, biking, motor cycling, fishing and more. Vacationers can relax under the sun in the summer or enjoy peaceful nights on our outdoor patio. Our sand beach is over 200 foot long with a buoyed swim area and raft, slip rentals, boats rentals, sand volleyball, horseshoe pits, children’s play area and a lakeside fire-pit are a few of the things we have waiting for you. We’re just 12 miles away from Wisconsin’s renowned Lake Geneva and the perfect spot to sit back, rest or play. A hotel at the start of the 20th century, Lily Lake Resort is rich with history. We are next to the New Munster Wildlife Area – part of the 1226 acreage of the Munster Bog Island State Preserve. Guests can enjoy numerous snow, hunting and hiking trails – all within walking distance or a short travel by bike or car. Our ten guest rooms are newly remodeled and have two queen sized beds with a full bath. Four of our rooms include an additional sofa sleeper. All rooms are air-conditioned, have a flat screen cable TV, in-room refrigerators, and Wi-Fi. Take a break at Lily Lake – your next great vacation destination!